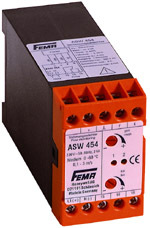 The flow in fluids can be monitored reliably with flow sensors SWF62 and SWF62L and evaluation unit ASW454. The sensitivity can be adjusted accurately with a rough and fine potentiometer. The switching state is indicated by LED. The sensor element must be located in the flow.